Flotsam, jetsam and kayaks off the Rinns of Islay. From Lossit Bay to Machir Bay the rocky ramparts of of the Rinns stretches for 8km almost unbroken. Kilchiaran Bay is the only breach in this coast's impenetrable armour but it was full of surf so we pressed on to Machir Bay. When I say "we pressed on", I am perhaps implying we had somewhat more choice in the matter than actually existed, given the reality of the building north going tide and force 4 tail wind. We kept well out (2km) from Machir Bay and the conditions moderated a little. However, it to be a short lived respite. 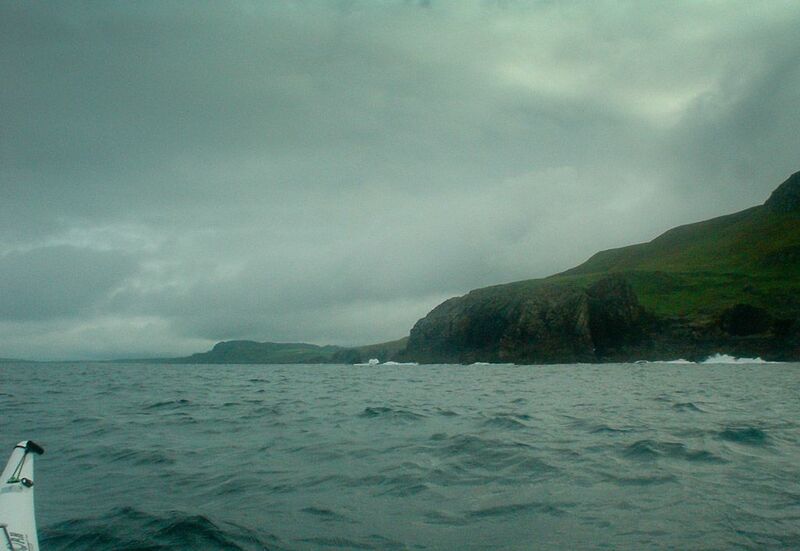 The west coast of the Rinns has a series of headlands round which the tide races. They have confidence inspiring names like Rhuba na Faing and Cape Fear. We were rapidly approaching the headland at the north end of Machir Bay. It was two and a half hours into the flood and the tide was fair steaming along. 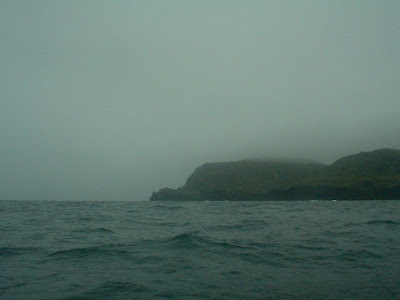 This particular headland consists of an offshore island and a channel littered with exceedingly sharp dark rocks. The island acts like a funnel and the tide accelerates through the channel like a venturi, carrying all flotsam, jetsam and kayaks with it. The surging swell, the rushing tide, the broken, white water receding and revealing fangs of black rock... it all led to an involuntary clenching of the jaws not to mention the gluteal muscles. After all this excitement, the fair weather we had enjoyed thus far deteriorated a little as we passed Saligo Bay. The clouds descended, it started to rain, the temperature dropped and the wind increased. This was after all the first week in August... always a risky time to go paddling in Scotland. We were now passing "Opera House rocks" which are more properly known as Dun Bheolain, site of an Iron Age hill fort. It is surrounded on three sides by surging surf, I don't think they would ever have expected to have been invaded from the sea. Ahead lay Cape Fear, where we hoped to turn east rather than be swept away by the tide to the north. It was three and a half hours into the flood and we could see the tide race heaving over the reef that extends far to the north west. 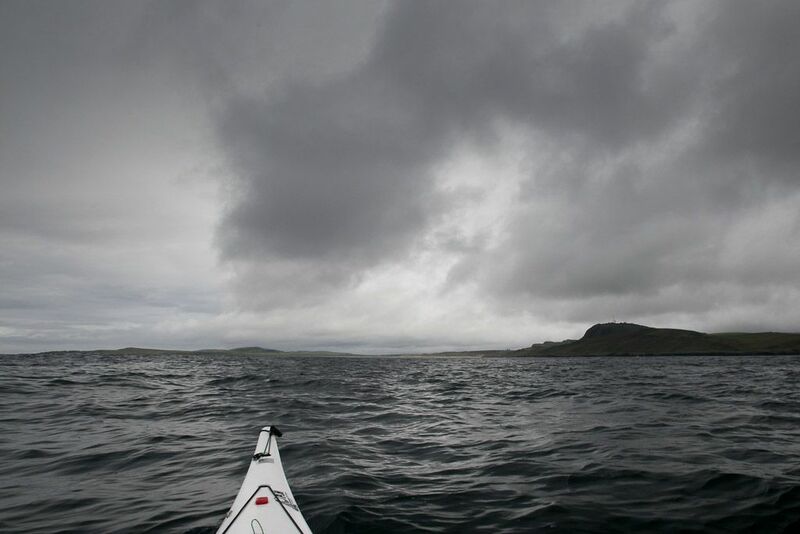 We kept well clear of the reef but the wild waters of the race took all our attention as we slowly turned our bows east. 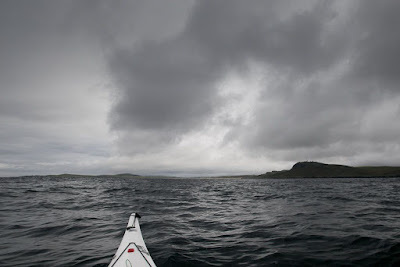 We paddled with a new vigour and the water was soon rushing beneath our keels. 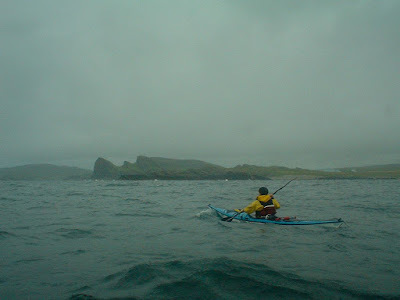 It was still rather rough and it was all we could do to keep paddling for the next headland Ton Mor. It seemed to be a very long way away and it wasn't getting any closer. I must apologise for the lack of decent photographs on this particular trip.